This post was prepared by Evelyn Brown, Chair of the Muskoka Algonquin Health Care (MAHC) Board of Directors, and appeared on the MAHC blog on February 14, 2018. You can see the original here. The Muskoka Algonquin Healthcare Board of Directors is drawing attention, through our political leaders, to the need for Muskoka ratepayers to start making investments now for future health care capital needs. On January 19, Phil Matthews, Vice Chair of the Board, and I appeared before the District of Muskoka’s Corporate & Emergency Services Committee to encourage the creation of a reserve fund for health care capital needs. Phil referred to this reserve fund as “a major asset that we don’t have today”. The timing of our presentation was based on the immediacy of 2018 budget deliberations by the District. The purpose of the presentation was to highlight the capital needs of the health care system and to demonstrate the importance of broad financial support, both today and in the future. Our presentation concentrated on MAHC’s current capital needs and also referenced an order of magnitude for future redevelopment costs. Our presentation was not for a specific figure or sum of money, but rather was asking consideration be given to creating a health care capital reserve fund supported annually by taxation. There are significant needs at MAHC today to safeguard and sustain the quality of care we provide. Our presentation indicated that our needs over the next three to five years are estimated at $39 million for equipment, technology and aging building infrastructure. Future redevelopment needs, regardless of the model selected, will be even more substantial (hundreds of millions of dollars over time) and will compound this challenge for our communities. Currently, there are insufficient funds available to MAHC for replacing capital needs – MAHC relies on the community through donations to our Foundations and Auxiliaries to replace aging infrastructure, and buy new equipment to keep pace with technology. Unfortunately, today’s capital needs outpace community contributions, meaning there are insufficient funds available now to fix aging buildings, let alone to bank toward any future needs. We also know today that the capital building cost (bricks and mortar) of hospital redevelopment is shared by the Ministry of Health and Long-Term Care, which contributes approximately 90 per cent, and what the Ministry calls the community’s “local share”, which is the remaining 10 per cent. Other infrastructure costs, such as parking lots, new equipment and furnishings, are also expected to be paid for by the community through donations, like they are today. These could add up to an additional 14 per cent or more of the building costs of future redevelopment. Our presentation referenced the potential order of magnitude of the community share of a future redevelopment. 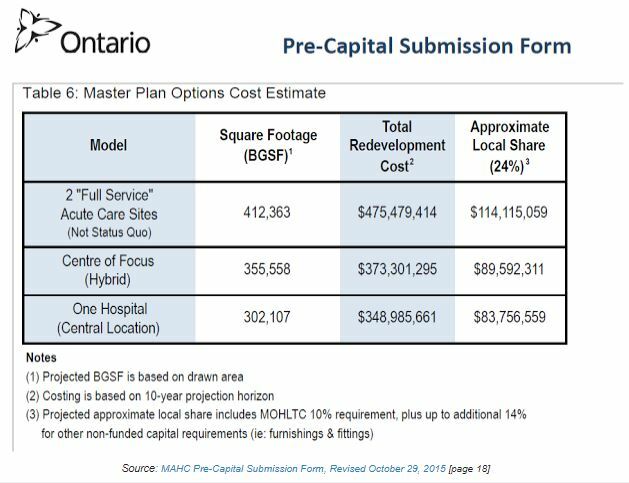 MAHC’s 2015 Pre-Capital Submission to the Ministry of Health and Long-Term Care included the cost surveyors’ estimate of the potential local share plus infrastructure costs of the three models that were previously developed for hospital redevelopment ranging from $84 million to $114 million (shown in the table below). The Capital Plan Development Task Force has been struck by the MAHC Board of Directors to recommend the best model for future hospital care that ensures high-quality, safe and sustainable care for future generations. The task force is committed to a thorough and comprehensive process to look at potential models for the future, even if they are unpopular, to satisfy the requirements of the Ministry of Health and Long-Term Care. The task force is researching three potential models and developing what programs and services could be provided through each of the models. This process continues and is a new chapter in MAHC’s future planning work with and the ending to that chapter has yet to be written. The timeline for the Stage 1 submission is dependent upon doing it right and taking the time that is necessary to ensure appropriate engagement and thorough analysis. No decisions have been made about the preferred model of delivering acute care in the future. The task force is aiming to bring its recommendation of a preferred model to the MAHC Board of Directors this spring, and to submit the Stage 1 (Part A & B) to Capital Investment Branch of Ministry by the end of 2018. Most importantly, we know that regardless of the model recommended by the task force and selected by the Board, it is prudent for Muskoka to begin investing in this multi-million-dollar fund now. Quite simply we can start to incrementally put aside funds now, or massively pay later. By asking our local leaders for prudence and forethought for the Muskoka ratepayers to support the needs of the health care system today and in the future, we do not believe we are undermining the Stage 1 future planning work that is underway. We are helping our local leaders to understand the role the community will need to play in building the future health care system. I’m only speaking for myself here, but I’m not willing to accept a huge increase in my District taxes to fund something of which I am adamantly opposed. Unless I am assured that this tax increase will go toward maintaining and upgrading our current hospitals, I’ll be fighting against this reserve fund. MAHC has a poor record of listening to us, the taxpayers who are paying for all this. They already know our preferred model. We’ve spoken loudly and clearly. And yet they still seem to be more interested in building a shiny new facility to show off to the world than in patient care. MAHC needs to tell us exactly what they’re going to do with the reserve fund so that we can decide if we’ll accept a tax increase. If they keep playing this game, they’ll have a fight on their hands. This is the exact same message that Chair Klink, Mayor Smith and myself have delivered to the Chair and Vice Chair of the MAHC Board! At the last District budget meeting, Council did endorse a resolution from myself and Mayor Smith to increase the current hospital financing levy from $400,000 per year to $600,000, and to change the way we commit those funds with a new focus on the EXISTING TWO SITES located in Muskoka! Scott: Regarding the option of a “central location” (eg. Port Sydney), has the District guesstimated the cost of the infrastructure that would be required to support a Hospital’s needs? The District has not done any costing for the infrastructure. We do know that the need may include roads, new water & sewer plants, new water & sewer lines etc, and we know that all of that would have a staggering price tag. Another important issue that we have raised with MAHC (and part of the reason we are back at the capital planning stage) is the land use planning issues. Provincial policy would not support the creation of a new urban area in between two existing urban centres with existing infrastructure to support a hospital and all the other businesses that would follow. Muskoka already has 8 individual water systems and 7 individual sewer systems, all of them with not nearly enough customers to effectively spread the costs. The staggering cost to build those facilities and to operate them is the reason the District was in so much debt for so many years and it is also the reason why Muskokans enjoy the highest water & sewer rates in Ontario. This is why Mayor Smith of Bracebridge, Reeve Cathy Stills of Burk’s Falls, myself and District CAO Michael Duben are now part of the planning process – so MAHC doesn’t present a new redevelopment plan with the same myopic vision as the last time. Well said , both Ruby and Scott. One Question, though….even if MAHC DID tell us exactly what they are going to do with the reserve fund, would you believe them?? I sure wouldn’t – the trust in them is gone. They are well aware of what the people they represent want, have ignored it, attempted to pacify everyone with a faulty questionnaire, and restructured their board to suit only their own purposes. They are not the only ones who can play the “manipulative game”. Agree – trust in them is gone. Burk’s Falls Hospital was closed so that Huntsville Hospital could afford to stay open. This is not a game! If District Council voted in favor of levying for a special reserve fund for hospital redevelopment, it would stay in District hands until it was time to spend the money – likely 15 to 20 years from now. Frankly, it would take at least that long to build up the reserve. Our point has always been that the funding formula is flawed. It penalizes every medium sized hospital in Ontario, not just ours. Our challenge to the province is to to first fix the formula so that small town Ontario is not constantly struggling to keep their Emergency Rooms open. I don’t think the current government really wants to lose the support of every community in Ontario that has a medium sized hospital. I don’t think they really want to close one of the hospitals in Muskoka. My message to MAHC is this: If the Province wants us to have only one hospital for all of Muskoka, East Parry Sound and Algonquin – make them do their own dirty work. MAHC should be working with local councils and the community to say to the Province, we must have the two acute care facilities we have now, and you must fix the operational funding formula so that we are not constantly scrambling to keep the lights on. Ruby and Scott, you both nailed it. More of the same .. you are not going to change the Prov Government who holds the money! ($$) They know what their decision is and so does everyone else! As an example … just look at what happen in Bala and what is happening there! Time to work with the Prov Government .. both Huntsville and Bracebridge need to start it now. Has election campaigning started? already?